Mesenah used mattress was donated by someone. Kelvin (left) and staff hands over some food items to Mesenah (right). 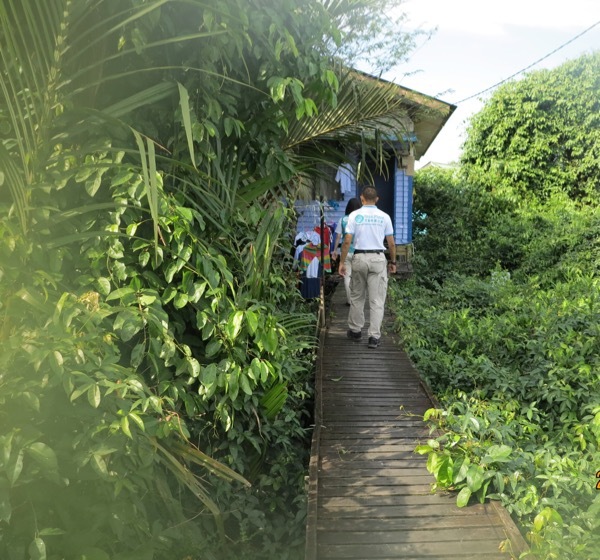 Kevin walking to Mesenah’s house through a small wooden bridge. KUCHING: Mesenah Binti Reh, a 58-year-old single mother, has been suffering from heart problems since 2015 and had fainted several times. Despite her condition she still needs to take care of a mentally retarded son. A daughter, who is also a single mother with two children, aged four and seven, is also staying with her. Her daughter Rosinah sells kuih in front of their house to earn some income. Due to lack of consistent income, they cannot effort to pay their utility bills. Hence, their water and electricity supply were often being disconnected. The Social Welfare Department has just started giving the family a monthly aid of RM200. Recently, Hope Place founder Kelvin Wan and his staff handed over food items including rice, cooking oil, salt, sugar, noodle, biscuit and Milo to Masenah’s family. Hope Place is an NGO that visits the poor and less fortunate families to contribute some essential food items like rice, cooking oil, sugar, salt, biscuits, and noodles. Many of these families or individuals barely earn enough to get through. Hence they are grateful to have these basic necessities delivered to them. For families with children with special needs, or elderly or disabled people, Hope Place provide them milk powder, oat and diapers. The organisation carries out aid deliveries once every two months because of the many families on their recipients list. Currently they support more than 170 families. For more information on how one could help, Hope Place can be reached at 013 5672775 or 082 505987 during office hours. Those interested to make cash donations can do so through their Maybank ac 511-8900-1160. Hope Place brings food items to the needy 0 out of 5 based on 0 ratings. 0 user reviews.